In 1861 18-year old Frederick Halsey Man graduated from City College. The ambitious and determined young man entered the Columbia Law School, intent on a career as an attorney. But the Civil War interrupted his plans. In 1862 he left school to volunteer for three months’ service for the Union. Upon his discharge in September 1862 he had risen to the rank of corporal of the 22nd New York Militia. His three-month stint would become three years, however; for he was immediately commissioned a captain in the 79th United States Colored Infantry. Two years later, in August 1864, he was transferred to the 84th United States Colored Infantry. When the war finally ended, he was brevetted a major “for faithful and meritorious service.” Frederick H. Man resumed his studies at Columbia, receiving his legal degree in 1865. As the century drew to a close, he was a well-known and respected lawyer, a partner in the legal firm of Anderson & Man and a member of several clubs. 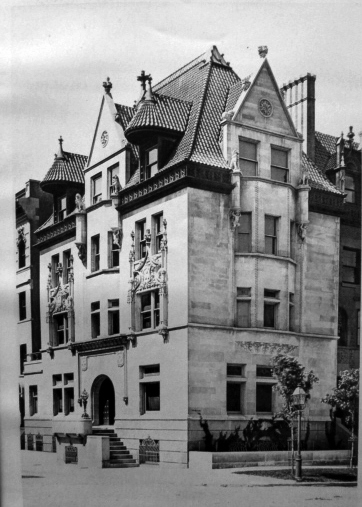 In 1890, while Frederick Man was growing successful, architects Lamb & Rich were commissioned to design a fanciful row of fourteen houses along West End Avenue in the burgeoning Upper West Side. Stretching from West 76th Street to 77th Street, they were an eclectic mix of styles; but the architects craftily repeated details and motifs to ensure that they blended as a unified string. The anchor of the block was the massive limestone chateau at the corner of West End Avenue and 76th Street. Spiky carved French Renaissance panels with semi-attached finials adorned the windows, copper clad dormers with conical tiled roofs jutted from the 76th Street side, while a Gothic-inspired copper cornice echoed that of the next door neighbor on West End Avenue. Perhaps most surprising and amusing were the small, rectangular columns on either side of the bay windows. Chubby cherubs uphold the columns on which ferocious lions sit. Because the entrance door atop the side-hugging stoop was quite definitely on West 76th Street, the house had the confusing distinction of having two addresses: No. 301 West 76th Street and No. 341 West End Avenue—no doubt a nightmare to letter carriers and visitors alike. The row was completed in 1891 and Frederick Man purchased the imposing house on the corner. By now the attorney could afford a country retreat in Budd’s Lake, New Jersey as well. His idyllic road would get bumpy when he met Clara Barton Hunter, an actress, in 1897. Neither party seemed to mind that Man was married at the time. In August 1899 the actress (who had been divorced from Francis Dill Hunter, Jr. in 1896) spent a week at Man’s country house. His sister-in-law, Mrs. Josephine Fuller Krotel was there as well, maintaining propriety. According to Hunter, it was during this stay that the attorney proposed to her, saying he was in the process of divorcing his wife. Man sold the house to Louis G. H. Murphy. An insurance agent, Murphy was killed when he left the Metropole Café on East 42nd Street with a friend on the evening of October 7, 1899. Across the street the new Pabst Building was being constructed and the elevator shaft to the sub-basement was open, guarded by an iron bar. As the pair tried to pass by, Murphy fell into the opening, plunging 35 feet to his death. Orlando Porter Dorman lived here next. Dorman was a warden of the Church of the Holy Spirit on 57th Street who traced his family through New England colonists to English and Norman French families. His father’s family first arrived in America in 1631 and his mother’s family came in 1621 on the next ship after the Mayflower. Dorman began his business career as salesman in a Hartford, Connecticut store and three years later, after he “became of age,” he was taken in as a partner. Eventually he moved to New York, opened his own brokerage firm O. P. Dorman & Co., and other businesses, finally organizing the Gilbert Manufacturing Company that made dress goods and linings. The company grew to one of the most prominent in the world and increased Dorman’s fortune. The hulking house at No. 341 West End Avenue continued to pass quickly through new hands as Dorman transferred title on January 10, 1902 to Frank Moyan, with a hefty mortgage of $80,000. The next year in June Colonel Robert C. Clowry purchased the house. At the time Clowry was the President and General Manager of the Western Union Telegraph Company. Clowry lived here for nearly a decade, selling the house in December 1910 to Eberhard Faber “the pencil king.” Faber stayed on for twenty years, eventually leasing the house on December 4, 1930. Before long, like so many of the grand homes of the Upper West Side, No. 341 was divided into apartments. Indeed, Gretchaninoff was already an established composer when the revolution of 1917 jolted Moscow. A student of Rimsky-Korsakoff, he celebrated the government’s overthrow by composing the “Hymn of Free Russia.” But his delight at the new establishment soon faded. Although the red tile roof was removed in 1983, the house with an amazingly interesting list of owners remains virtually unchanged since 1891.